Ben is an Irish Thoroughbred and was originally trained for cross country eventing. 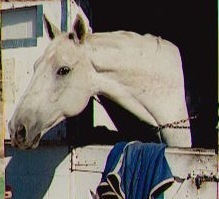 Due to an injury he was no longer considered an eventing horse and my daughter became his owner. He loves to jump and has a love for competition. Just like anyone competing he gets nervous before hand and like any athlete, goes through a carefully organized training program. Here they are clearing a 4 ft. high jump with ease! What a site they made, both just loving the fun and challenge of perfect timing. 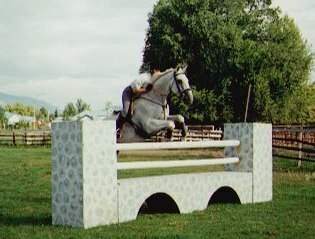 Together they won the Junior Jumper Championship at the IPE in Armstrong B.C., in 1994. The following Spring, Ben suddenly started to limp slightly during a competition. He was withdrawn from the competition immediately. The next day he was extremely lame and his leg was swollen, he spent the next few months very lame and in pain. Slowly he started to improve to the point where he could join the other horses in the pasture. After many x-rays, and various Vets the only conclusion they have come to is that he has some arthritis. He has been resting his leg with some improvement for the past couple of years. My daughter, being a very determined person started to give him Glucosamine last December. She works at a Drug Store and has heard many stories from the elderly, of how Glucosamine has all but 'cured' their arthritis. So Ben gets a daily dose! He is greatly improved now after 5 months of treatment. It's been a long 3 years for them both but my daughter has just started to ride Ben again. It's a lovely site to see. There won't be any jumping, just some casual fun for both of them. Visit the EQUINE CHEF here horse treats! Visit HORSE COUNTRY hereLots of horse info! Visit the CLIP ART STABLE here horse graphics!